KENNEDY SPACE CENTER, FL – A major overhaul of the iconic Vehicle Assembly Building (VAB) readying it for launches of NASA’s SLS Mars rocket by 2018 has reached the halfway point with installation of massive new access platforms required to enable assembly of the mammoth booster at the Kennedy Space Center (KSC) – as seen firsthand during an exclusive up close facility tour by Universe Today. “We are in the full development stage right now and roughly 50% complete with the platforms on this job,” David Sumner, GSDO Deputy Sr. project manager for VAB development work at KSC, told Universe Today in an exclusive interview inside the VAB’s High Bay 3 on July 28, amidst workers actively turning NASA’s deep space dreams into full blown reality. See our exclusive up close photos herein – detailing the huge ongoing effort. Upgrading and renovating the VAB is specifically the responsibility of NASA’s Ground Systems Development and Operations Program (GSDO) at Kennedy. Inside VAB High Bay 3 – where previous generations of space workers proudly assembled NASA’s Saturn V Moon rocket and the Space Shuttle Orbiter launch stacks – today’s crews of workers were actively installing the newly manufactured work platforms needed to process and build the agency’s Space Launch System (SLS) rocket that will soon propel our astronauts back to exciting deep space destinations. It’s certainly an exciting time as NASA pushes forward on all fronts in a coordinated nationwide effort to get the SLS rocket with the Orion EM-1 crew vehicle bolted on top ready and rolled out to Kennedy’s pad 39B for their planned maiden integrated blastoff by Fall 2018. SLS and Orion are at the heart of NASA’s agency wide strategy to send astronauts on a ‘Journey to Mars’ by the 2030s. SLS is the most powerful booster the world has even seen and is designed to boost NASA astronauts in the agency’s Orion crew capsule on exciting missions of exploration to deep space destinations including the Moon, Asteroids and Mars – venturing further out than humans ever have before! I walked into High Bay 3, scanned all around and up to the ceiling some 525 feet away and was thrilled to see a bustling construction site – the future of human voyages in deep space unfolding before my eyes. As I looked up to see the newly installed work platforms, I was surrounded by the constant hum of plenty of hammering, cutting, welding, hoisting, fastening, banging and clanging and workers moving equipment and gear around. Altogether a total of 10 levels of work platform levels will be installed in High Bay 3 – labeled K to A, from bottom to top. Each level consists of two platform halves, denoted as the North and South side platforms. “We are looking up at 5 of 10 platform levels with 10 of 20 platform halves installed here. A total of ten levels are being installed,” Sumner explained. “We are up to about the 190 foot level right now with Platform F installation. Then we are going up to about the 325 foot level with the 10th platform [Platform A]. So much work was visible and actively in progress I definitely got the feeling from the ground up that NASA is now rapidly moving into the new post shuttle Era – dominated by the mammoth new SLS making its assembly debut inside these hallowed walls some 18 months or so from today. Two additional new platform halves are sitting in the VAB transfer aisle and are next in line for installation. With two more awaiting in VAB High Bay 4. Fabrication of additional platform halves is ongoing at KSC’s nearby Oak Hill facility. Hensel Phelps is the general contractor for the VAB transformation. Subcontractors include S&R, Steel LLC, Sauer Inc., Jacobs and Beyel Bros Crane and Rigging. The work platforms enable access to the SLS rocket at different levels up and down the over 300 foot tall rocket topped by the Orion crew capsule. They will fit around the outer mold line of SLS – including the twin solid rocket boosters, the core stage, and upper stage – and Orion. 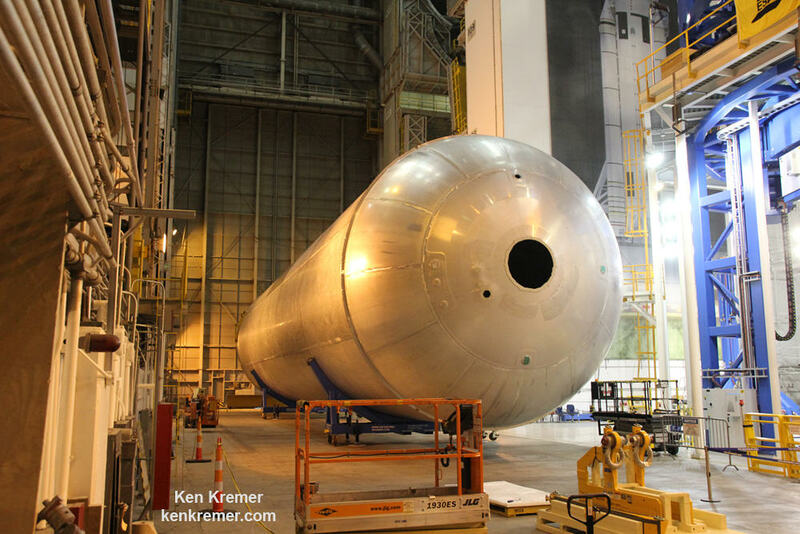 The SLS core stage is being manufactured at NASA’s Michoud Assembly Facility in New Orleans, where I recently inspected the first completed liquid hydrogen tank test article – as reported here. Orion EM-1 is being manufactured here at Kennedy – as I reported here. The platforms will provide access for workers to assemble, process and test all the SLS and Orion components before rolling out to Launch Complex 39B atop the 380 foot tall Mobile Launcher – which is also undergoing a concurrent major renovation and overhaul. As of today, five of the ten levels of platforms are in place. Each of the giant platforms made of steel measures about 38 feet long and close to 62 feet wide. They weigh between 300,000 and 325,000 pounds. The most recently installed F North and South platforms were put in place on the north and south walls of the high bay on July 15 and 19, respectively. How are the platforms installed ? The platforms are carefully lifted into place by workers during a process that lasts about four hours. Then they are attached to rail beams on the north and south walls of the high bay. Construction workers from Beyel Bros Crane and Rigging also use a Grove 40 ton all terrain crane. It is also outfitted with man baskets to get to the places that cannot be reached by scaffolding in High Bay 3. Installation of the remaining five levels of platforms should be completed by mid-2017. “The job will be done by the middle of 2017. All the construction work will be done,” Sumner explained. The platforms will be tested beginning later this year, starting with the lowest platforms at the K-level, and working all the way up to the top, the A-level. The platforms are attached to a system of rail beams that “provide structural support and contain the drive mechanisms to retract and extend the platforms,” according to a NASA fact sheet. The F-level platforms are located about 192 feet above the VAB floor. “Using the five platforms that are now installed, workers will have access to all of the Space Launch System rocket’s booster field joints and forward skirts, the core stage intertank umbilical and interface plates,” says Mike Bolger, GSDO program manager at Kennedy. ‘NASA is transforming KSC into a launch complex for the 21st Century,’ as KSC Center Director and former shuttle commander Bob Cabana often explains. So it was out with the old and in with the new to carry out that daunting task. “We took the old shuttle platforms out, went down to the [building] structure over the past few years and are now putting up the new SLS platforms,” Sumner elaborated. 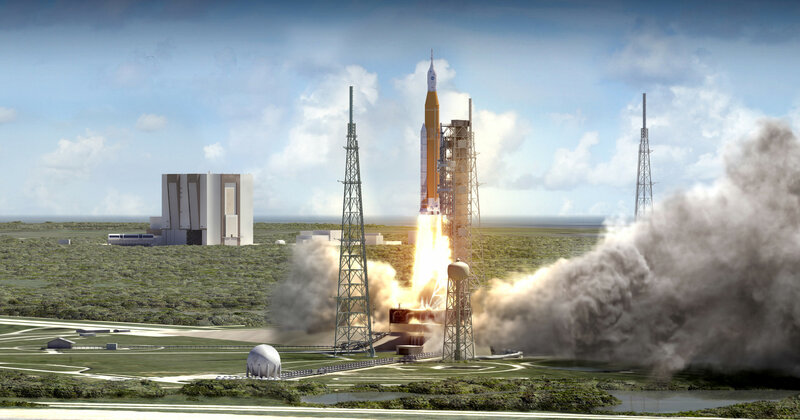 And after NASA launches EM-1, significantly more VAB work lies ahead to prepare for the first manned Orion launch on the EM-2 mission set for as soon as 2021 – because it will feature an upgraded and taller version of the SLS rocket – including a new upper stage. Thanks again Ken for being there for us as our “Man on the inside”. It is much appreciated! Stacking that beast (The SLS) will be an incredible engineering feat! Am trying to visualize all the ongoing planning and co-ordination that went/goes into the process and really cannot. But can imagine it would add up equivalent to a couple hundred telephone books worth of printed media? Yikes! Agree with Aqua – Great article. Thanks Ken. Very interesting to see how such a monster rocket is built and how the building to build the rocket is built too.. Amazing! Right up there with skyscrapers – A testament to human ingenuity.. The workers must feel the Apollo and shuttle history and be inspired to be part of the next era..